The National Government needs to address the issue of foreign currency shortages in addition to urgent measures to ensure fiscal consolidation and reduced government borrowing, Opposition Leader Patrick Pruaitch said today. The Opposition Leader, Hon. Patrick Pruaitch, said economists at a recent forum at the Development Policy Centre at the Australian National University in Canberra have said lack of foreign currency was a key cause of the big plunge in PNG imports. They warned that lack of access to foreign exchange had become the “No 1 issue for business” and if prolonged could cause PNG to face another “lost decade” of economic growth, similar to what happened in the 1990s. 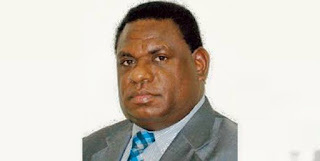 Contributory factors include the incompetence of the Bank of Papua New Guinea in ensuring that PNG companies are repatriating home net export revenues and the inflationary impact of BPNG’s decision to print money to fund the National Government deficit, Mr. Pruaitch said. The four economists presenting at the Canberra forum rejected Government claims the economy was continuing to grow and provided evidence they believed was proof of an economic recession in 2015 and 2016. In a joint presentation they said output and sales by the business sector has fallen by 2035% from its peak with negative economy-wide negative growth contributing to a 25% fall in tax revenue, inclusive of GST, income tax and non-resource corporate tax. Mr. Nelson Nama, an economics lecturer at the University of PNG, told the forum formal sector employment declined in 2015 and 2016. Last year personal income tax collection fell K192.8 million, company tax collections were down K281 million and GST collection fell K124.4 million. First, institute an immediate independent audit of export revenues of mining companies to ensure adherence to respective project agreements, which BPNG has thus far failed to do. Second, instruct Kumul Petroleum to shut its corruption-prone Singapore bank account and to repatriate all revenues back to PNG following ending of the K3 billion UBS loan facility that required LNG revenues to be deposited offshore. Third, proceeds of all Government foreign grants and loans, including those from Australia, China, the World Bank and Asian Development Bank should be deposited in PNG-based banks with payments made directly from these accounts. Mr. Pruaitch said: “Foreign exchange shortages have sharply impacted on PNG imports and contributed to rising unemployment levels since 2013. “Because BPNG is failing to perform its constitutional role as an independent Government agency with responsibility for monetary policy it is also contributing to rising inflation by printing money to fund the Government’s deficit budget. Mr. Pruaitch said BPNG has failed in its mandated task of monitoring PNG’s gold, copper and nickel exports to ensure that all surplus funds are repatriated back to PNG and not left in overseas bank accounts to serve corporate interests. “The BPNG Governor, Mr. LoiBakani, continues to mislead the public by claiming that Government policy allows mining companies to retain export revenues in overseas accounts. Project agreements for Lihir and Porgera require all net export revenues to be repatriated to PNG on a quarterly basis. Mr. Pruaitch said that unlike the government-owned Ok Tedi Mining Ltd, which is repatriating all its foreign revenues back into Australia, he believed companies such as Newcrest Mining and Barrick Gold only brought in enough funds to cover their PNG operating costs. “This practice must not be allowed, and an independent audit will show if this was the case,” he said. Total exports last year hit at an all-time high of K25 billion with gold exports contributing a record K6.9 billion. Mining companies are making solid profits after several years of cost cutting and something would be amiss if their corporate tax payments do not increase this year. Mr. Pruaitch said economists at the PNG Forum, as was the case with the International Monetary Fund, support depreciation of the kina on grounds that it is over-valued. “It would be a serious mistake for Government to take this step without ascertaining the real reasons why foreign currency inflows do not reflect the nation’s export revenues,” he said.